At the Manchester School of Art, Feilden Clegg Bradley Studios utilised the façade strategy to unify the new-build and refurbishment elements of the scheme, using wide bands of black anodised aluminium interspersed with strips of glazing. These are oriented vertically on the new-build and horizontally on the refurbishment. Detail of perforated vent panel. SchuecoAwards Manchester School of Art detail of Chatham Tower window. For the overclad of the 1960s Chatham Tower, the architect was keen to retain a slim profile but deliver a more efficient façade than the single-glazed ribbon windows it replaced. FCB Studios removed the original glazing and introduced a thermal envelope using the Schueco AWS 70.HI window system with inward opening sidelights using manual actuators. Although the overall area of glazing was reduced, the panels were larger. ‘The strategy was to make bigger views but with less window,’ says FCB Studios partner Tom Jarman. The 8000m2 new building of studios, workshops and gallery space uses Schueco’s FW 60+ SG curtain walling system on the seven-storey north elevation. This stick cladding system combines clear glazing, mirror-backed shadow box units, perforated venting panels and polished stainless steel vent panels. At ground floor the perforated panels are based on a wallpaper design by past tutor Lewis Day. Judges appreciated the ‘handsome and elegant’ use of the new curtain walling. ‘The detail of the ventilation panels is lovingly considered,’ says Sunand Prasad. which makes it all hold together,’ adds Deborah Saunt. Schueco Awards Manchester School of Art. Schueco Excellence Awards 2014: Commended, Sustainability. Feilden Clegg Bradley Studios’ overcladding of Chatham Tower substantially improved the environmental performance of the 1960’s building, which suffered from significant solar gain and poor comfort levels in both summer and winter. ‘We felt the frame had plenty more life in it yet, so the challenge was to resolve the critical thermal issues,’ says partner Tom Jarman. 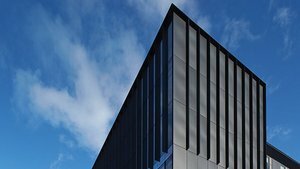 The reclad introduced a new thermal envelope that reduced glazing by 40% and used solar controlled low-e glass to mitigate solar gains. A rainscreen over-sails high level venting to enable draft-free background ventilation. The new-build part of the project has been rated BREEAM Excellent.